Located in the isolated northern ridge of the Academy of Sciences Range and the Pamir Mountains, Korjenevskaya Peak rises 7105 meters (23,310 ft) above sea level. The peak was discovered by Russian scientist and geographer N.L. Korjenevskiy on August 10, 1910 and was named in honor of the wife of the explorer Evgeniya Kornjenevskaya. Korjenevskaya Peak has appeared on geographical maps since 1927. Evgeniya Kornjenevskaya was a popular explorer of the Pamirs. His unsupassed knowledge of the geography of Central Asia was renowned at the time. Three major glaciers bear his name today – two in the Tian Shan Mountains and one in the Pamir Mountains. Korjenevskaya Peak was first climed in by a Soviet expedition in 1953. There are now about 10 different routes of various levels of difficulty. 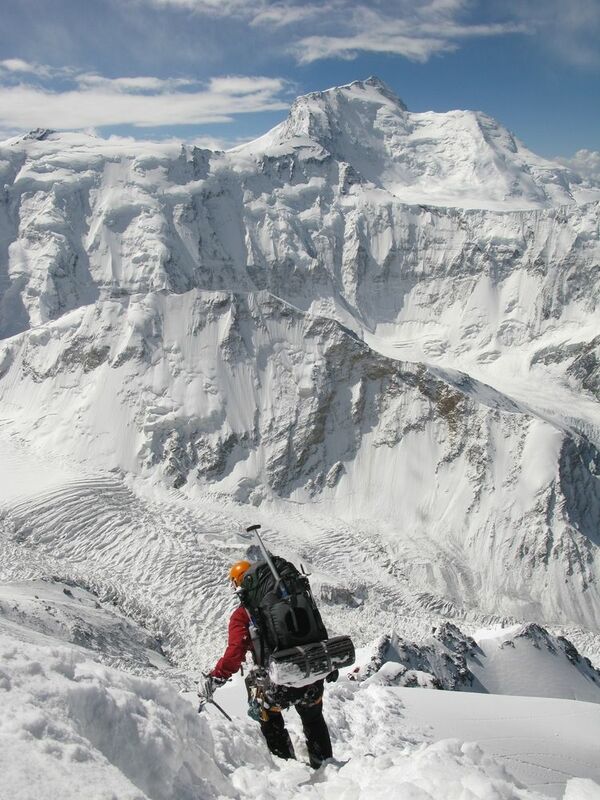 The safest and easiest route to the summit starts from Moskvina Glacier and goes along a southern ridge. 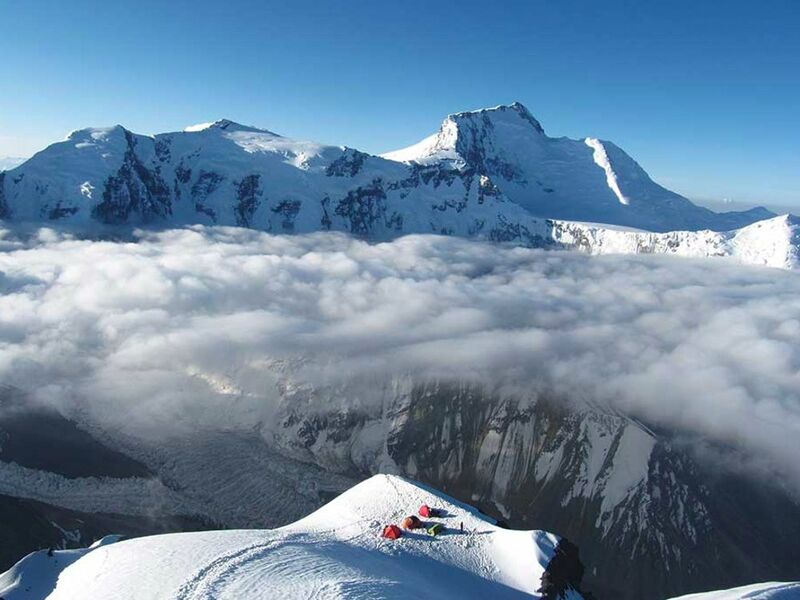 The Base Camp, situated at 4200 m (13,780 ft) at the confluence of Walter and Moskvina Glaciers, is the perfect starting point for climbing both Somoni Peak (24,590 ft) and Korjenevskaya Peak. 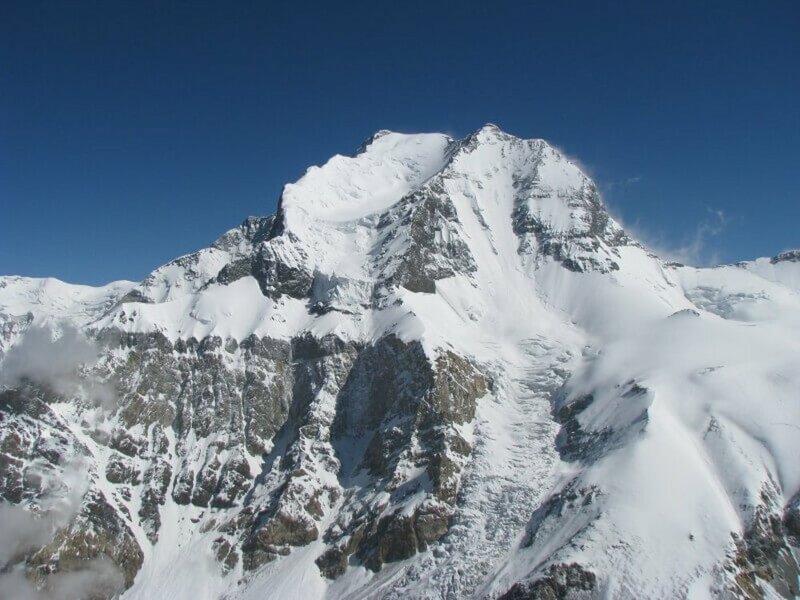 The main difficulties are high altitude and considerable physical exertion. Nevertheless, a magnificent view of the entire Pamir range compensates for the effort. The safest way for Korzhenevskaya climbing leads up from the Korzhenevski Glacier; mostly easy rock scrambling low down with extended snow and ice above. To Camp 1, hiking up along small river and crossing the Moskvin Glacier lead to the first bivouac site. 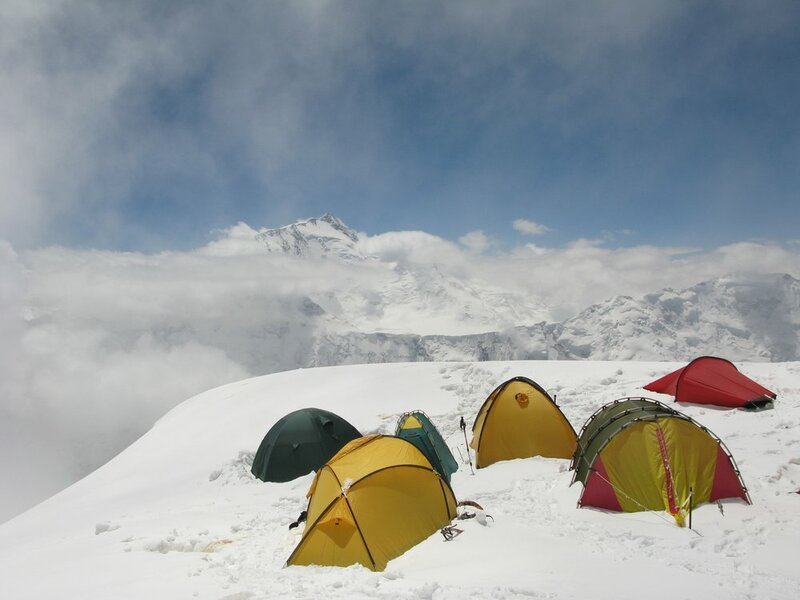 Camp 1 to Camp 2 – The route goes along a rather steep glacier, which comes down from the south slope of the mountain. Camp 2. is located at Morene. In the case of good weather, you can see all the way to the summit from this camp. Camp 2 to Camp 3 – The route continues up the ice/snow slope and then a long traverse using crampons and ice axes toward the south ridge. Camp 3 to Camp 4 – Here climbers meet the key of this route — the vertical rock step of about 50 m (164 ft). Then a long and technically easy way up along the snow crest. Camp 4 to Summit – The route follows the snow crest towards the top. The view of a thousand summits (especially, Communism Peak) from here is great! When planning your expedition, please coordinate with our helicopter schedule to the mountain BEFORE booking air tickets.